They will travel from far and wide; the destination is the northern coastal Belgian city of Ostend. It is for many, as several years ago it was for me, the annual pilgrimage; the start of what in Europe is the new season. 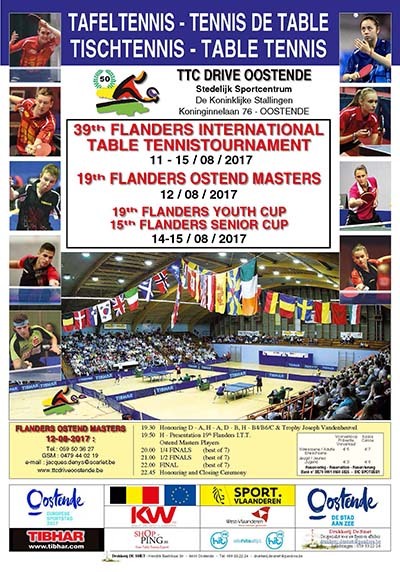 Organised by TTC Drive Oostende, the Stedelijk Sportscentrum is the home the 39th Flanders International Tournament; directed as always by Jacques Denys, proceedings commence on Friday 11th August and conclude on Tuesday 15th August. Notably, Belgium’s two Rio 2016 Paralympic Games gold medallist will be competing, Laurens Devos will play in Class A, Florian Van Acker in Class B and Class A. Basically you play in your own Class and the one higher. Most impressively 72 players will compete in Men’s Singles Class A, an event where there is a twist to the tale. Lose at the semi-final stage and you play in the final, win in the penultimate round and you progress to join the six invited players to compete in the Ostend Masters. The six players invited are Belgium’s Cédric Nuytinck and Robin Devos alongside Slovenia’s Bojan Tokic, Germany’s Bastian Steger and Ukraine’s Kou Lei.